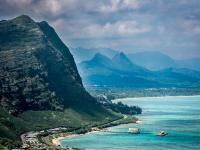 Waimanalo is located on Oahu's scenic eastern shore with miles of beautiful beaches set beneath the backdrop of the lush and furrowed Koolau mountains. Waimanalo provides everything you need for a spectacular Hawaii vacation. Visit the scenic eastern shoreline to enjoy the miles of white sand and blue water. 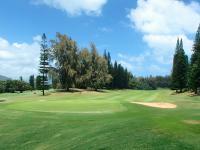 Golfers will enjoy three windward golf courses including the Pali Golf Course with great views of Kaneohe Bay, the scenic and challenging Koolau Golf Club, and the Olomana Golf Course favored by President Obama when he visits Hawaii. Take a drive up the windward shore to visit Kailua Bay and walk through downtown Kailua, and visit Kaneohe Bay and continue on to the north shore to see the famed surfing beaches of Waimea Bay, Banzai Pipeline and Sunset Beach. Waimanalo Bay Beach Park is nice for swimming with a long, white-sand beach that slopes gently into the sea. Lifeguards, restrooms, showers and shady areas for relaxing make it a great place to enjoy the Hawaii day. It's an easy drive up to Kailua Bay which is popular for a variety of water activities including kayaking, stand up paddle boarding, snorkeling and more. Also in Kailua is the lovely Lanikai Beach which many consider to be Hawaii's pretties beach due to its powdery white sands, crystal clear water and scenic views.Head south from Waimanalo to Makapuu Beach and walk the trail out to the lighthouse at Makapuu Point, the easternmost spot on the island. For a great Hawaiian plate lunch to take the beach stop in at L&L Hawaiian Barbecue in Waimanalo where they serve up their own distinct brand of Asian and American fusion cuisine including seafood dishes and steamed Kalua pork wrapped in taro leaf. Stop in at Dave's Hawaiian Ice Cream for specialty ice cream treats and tropical flavored shave ice. Head up to Kailua for a wide range of dining choices from casual fare to fine cuisine. For a hearty dinner try Buzz's Original Steakhouse on Kailua Beach known for their prime rib and seafood dishes. The Kailua Town Market is held Sunday mornings and a great place to hear live music as you stock up on fresh fruits and local produce and taste the home-baked products offered by vendors. Stop in at the Honolulu Nuts and Ukulele Company in Waimanalo to check out nuts and dried fruits as well as ukuleles. Head south to more shopping at the Hawaii Kai Towne Center, Kahala Mall and the many shops of Waikiki and downtown Honolulu. To the north of Waimanalo is Kailua town with a walkable commercial district where you can browse boutique gift shops, art galleries and also department stores. A bit farther north is the Windward Mall in Kaneohe. Renting a car is recommended when staying in Waimanalo so you can enjoy the east shore's exceptional beaches and also visit other Oahu sights and attractions from the pristine northern shore to the excitement, shops and dining of Waikiki and downtown Honolulu. Most major populated areas of Oahu can also be reached on the public transit system known as "TheBus." Waimanalo weather ranges from about 70 to 85 degrees F. throughout the year with rain and wind conditions varying in different areas throughout the Island. The eastern and northern shores are generally a bit wetter and cooler than the south and west shores, and the winter months typically see more rain than summer. Sunny skies, mild temperatures and warm trade winds make Waimanalo an excellent vacation destination all through the year. Rain showers are typically brief and light with ample sunshine even on the rainier days. Hawaii's predominant trade winds blow from the northeast bringing moisture-laden clouds that typically rain onto the mountains of the east and north shores creating green and lush landscapes.Trade winds are almost always calmest in the mornings so it's a good time to visit the beach. Ocean conditions vary each day though typically the north shore will have the calmest waters during the summer months and the south shore will have the calmest waters during the winter. Some beaches provide more protection from the open ocean, and if the waves are too big at the beach you visit then you may be able to find a more sheltered beach where water activities are safe. For swimming and ocean activities visit Oahu's lifeguarded beaches, obey all posted warnings and ask about the conditions on that day for the activities you choose. Waimanalo vacation homes provide the optimal way to enjoy your Hawaii vacation with all the luxuries of resort living and all the comforts of home. Browse through our Waimanalo vacation rental listings to get an understanding of the different amenities and property features we offer. 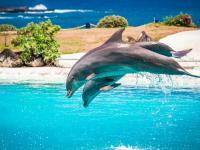 Our goal is to provide you with a with an unforgettable Waimanalo accommodation for your dream Hawaii vacation. We take pride in having the largest selection of high-quality vacation rentals on Oahu and we stand behind our product, making sure only the best of the best Waimanalo properties are listed on our site. If you have questions about our Waimanalo rentals or which Oahu destination is best for your vacation needs, please give us a call and we will be happy to assist you. In 1878 the Waimanalo Sugar Plantation began operating, continuing until 1947. Waimanalo Beach Park was once the site of the Waimanalo Landing used by inter island steamers and ships used by local communities and the sugar plantations. In 1921 a presidential Executive Order set aside the park for public use. The north half of Waimanalo Bay the southern half of Bellows Field Air Force Station was transferred to the state of Hawaii in 1966 and became Waimanalo Bay Beach Park.